The humble feeding pillow. It is probably one of the most underrated baby items because, despite its name, it is so much more than just a feeding pillow. 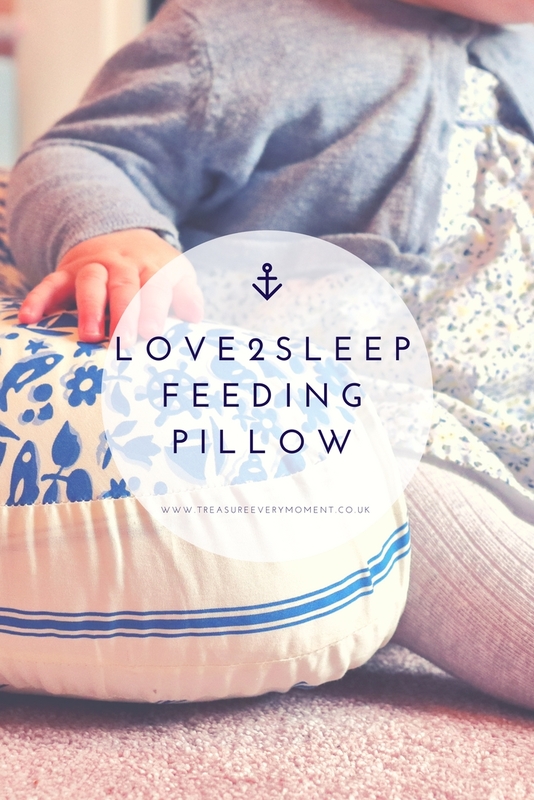 After having Isabella and beginning the breastfeeding journey I quickly realised how important having a feeding pillow was. They help achieve a better position for feeding, saving you from leaning over all the time. But as time goes on they also act as the perfect support for babies learning to sit up and as protection from sharp corners/fireplaces when rolling or crawling. I remember my back hurting so much in those early weeks of breastfeeding Isabella because I wasn't ensuring I had adequate support. That wasn't a mistake I wanted to make again when it came to feeding Poppy, so I ensured we had various feeding pillows around the house. One upstairs and one downstairs meant I didn't have to try to coordinate carrying a pillow, baby and toddler everywhere I went. Anything to make life easier! Love2Sleep have a wide range of Feeding Pillows, including this one with a beautiful Seaside themed cover. They are filled with subtle non-allergenic hollowfibres, which creates a soft yet strong pillow for supporting both you and your baby. The height of the pillow is such a positive when using it for both feeding and supporting a sitting up baby because it provides just the right amount of support. If Poppy leans for a toy when she has one of our other feeding pillows around her she will sometimes end up lying on the floor because there isn't enough support. However, this Love2Sleep Feeding Pillow is high enough to allow Poppy to reach for a toy and get herself back up to sitting. The cover is made from soft Egyptian cotton, so it is ideal for using from the adorable tiny squishy newborn age. You can choose from a wide range of covers, including duck egg blue, spring, feathers, grey, lemon, zig zag, spaceman, hearts, teddy bear, pink stripe, blue check, emoji, polka dot, space, milky way and bird cages. Truly something for everyone and every nursery design. When it comes to price Love2Sleep have affordability at the forefront with the Feeding Pillows costing between £12.95 and £14.95. But, even better than that, between the 12th-18th February 2018 they have selected Feeding Pillows at 2 for £14.95! That offers incredible value for money and means you can get two for different rooms in your house or order one for you and one for a friend/family member or if you if have twins then this is meant for you. What was your top baby essential? Oh I love feeding pillows and I agree they can be used for so much more. I haven't long thrown mine from #3. I love the pattern on this pillow. I completely agree that a feeding pillow is so much more than just a pillow. I didn't have one at first and quickly realised my error so had to dash out and get one. Comfort is the key to happiness! I love how shes able to feed with the pillow as well as comfortable sit with her siblings and not miss out on the fun! Wow, they are really good value especially when they are two for the price of one! I had some BF pillows like those and although I did use them a little bit, I wasn't able to sit my babies up in them (they weren't anywhere near sturdy enough). Love that these are so flexible! These look really good. They look quite comfortable too. I also like the design of this one! Looks so versatile. Thanks for sharing! I loved our feeding pillow too and I didn’t even breastfeed! Like you say, so many uses - my son especially loved it for tummy time. I could not have coped without my bf pillow. But after over 2 years feeding my two bubs, I had to throw it away. this pillow is beautiful! It will be so much of help for breastfeeding mums, especially at the beginning. I just used normal cushions, but lovely fabric on that one. Looks v comfortable. Ooh what a great idea and I love that design! Feeding pillows are a definite life saver and this one looks fantastic! It looks so comfy for mum and baby and the price is great too! I love pillows like this. Had one when my twins were babies. I never had a feeding pillow with my son and I'm hindsight could have done with one. This one sounds great and I love that they've a good range of options when it comes to design too. Such a lovely feeding pillow. The fabric is beautiful. We had nothing like this when mine were little. This is one of those ideas where you wonder how no one thought of it before. I certainly wish they'd had them when mine were smaller! I nearly got one of those when Baba was born. But this one is so pretty! I love the pattern!